The 33rd Parallel and its mysterious connection to the world. I am not certain if anyone has ever researched the phenomenon of the 33rd Parallel, but it has an extraordinary connection across the world and “33” is a significant number. 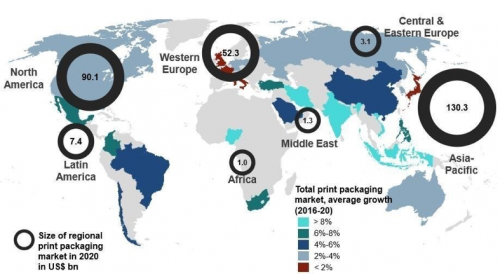 If we track the heat map of growth in print packaging in 2020 across the world, the most significant growth in the world is occurring across this parallel. I flew just over 282,000 miles last year, which is the equivalent of 11.5 times around the world. When you see the world markets moving first-hand, you get a great sense of this growth phenomenon occurring across the world. Cities that make investments in technology companies, education and support both knowledge and innovation are booming across the world. I look at the city I live in, Austin, Texas, and it is the #1 city for jobs and when I moved here there were 500,000 people, now we have 2 million. The cities and countries that used to be the giants of the world are about to be overcome with innovation and speed to market growth. Ernest Hemingway’s Law of Motion, noted in his 1926 novel, The Sun Also Rises, poignantly states, “Two ways, gradually then suddenly”. If we look at the industrial revolutions of history, which we are now in the 4thIndustrial Revolution, things are moving at an incredible clip, much faster than other industrial revolutions. Change is inevitable, but the pace of change in today’s world is so rapid and if you are not paying attention you will be on the other side of change before you even know it is upon you. Idealliance has 12 global offices, our biggest growth of offices is within the 33rd Parallel.